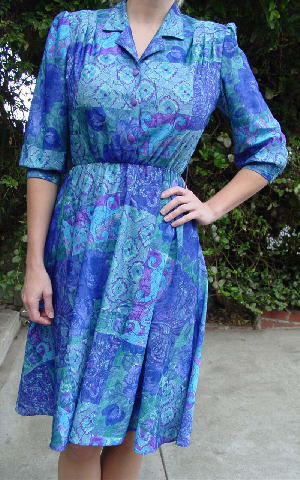 This 100% polyester dress is a vintage California Looks and was made in the USA. 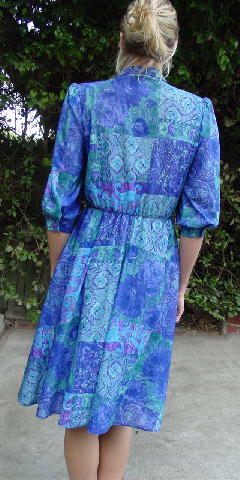 It has 3/4 length sleeves with one button cuffs and three purple buttons down the front. There are shoulder pads, an elastic waist, and belt loops, but no belt (check out out belt section). It also has two side seam slit pockets. 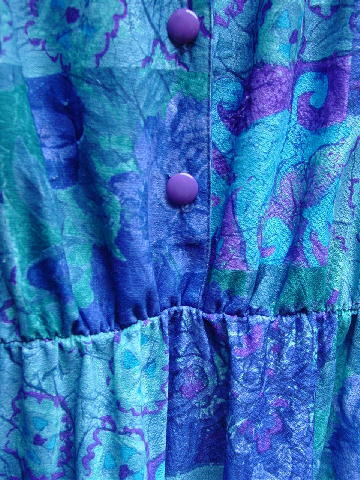 There is a design pattern in greens, blues, purple, and light grape-mauve. It has a full skirt. The tag says 8 P, but it fits more like a 6 petite. shoulder pad to shoulder pad 16 3/8"
shoulder to hem 41 1/4"